Chic better legs | Chic first: an elegant view on beauty, fashion and lifestyle. It’s summer time and we all want luminous, tanned skin, that’s a given. And whether we’re seeking to enjoy the natural sun light or simply “nail that light from within” thing, there’re now products that can deliver. The only downside is deciding which option is best. My complexion is very sensitive, pale, and milky. Don’t get me wrong, I’m not among those who dislike their natural whiteness, especially in winter, but with shorts and skirts, as well as on a beach, I think that less white legs look more chic. If you, like me, fear the damages of sun (dark spots, wrinkles, redness) or you haven’t got enough time for tanning, you can go for a self-tanner. Nowadays there are products that don’t smell disgusting and that don’t make people look streaky or orange. I’m not at all an expert of self-tanners and I’m not motivated to rush out and try them all. Frankly I’ve already found what works perfectly on me and perhaps my little selection can help you save some money and effort. Here are my personal summer beauty essentials for the legs. 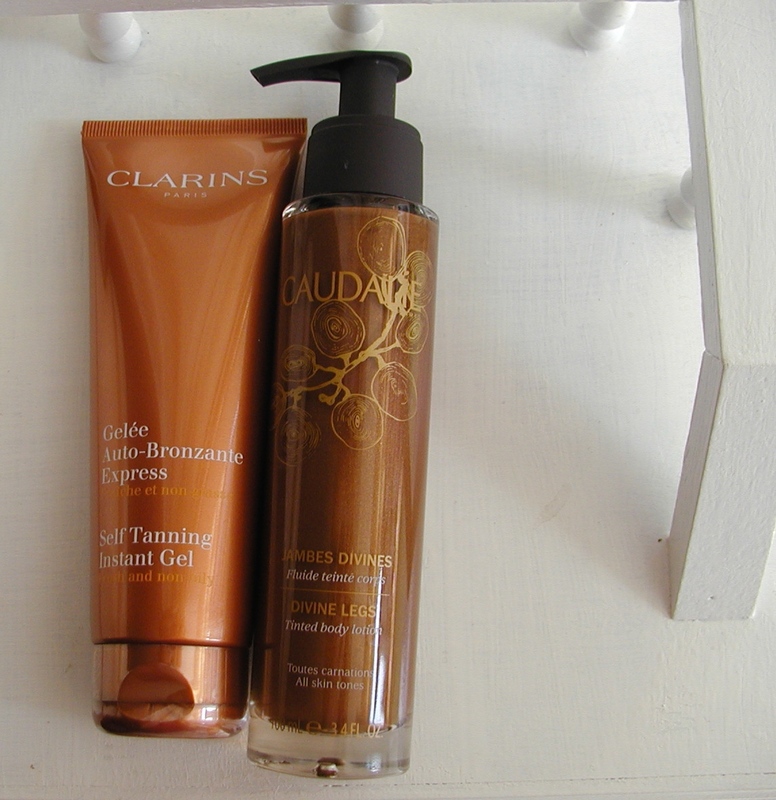 Clarins self tanning instant gel is a lightweight gel that soaks into the skin immediately, so there’s no downtime and you can get dressed or go to sleep, without the fear to stain all your clothes or sheets. On me it takes two hours to work, and then my body achieves a healthy glow, which doesn’t look that “fake”. You can use it on both face and body and on the legs it looks absolutely gorgeous. This entry was posted in Beauty, Body care, Shopping, Spring/Summer and tagged body care, caudalie, chic, chicfirst, Clarins, Self tan. Bookmark the permalink.